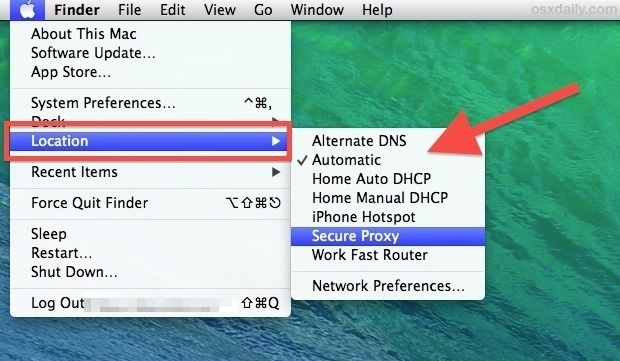 Network Locations in OS X allow you to save specific configurations and settings for different networks. Once they’re setup, you can use them to change between various network configurations quickly, without having to re-enter any settings. These are perfect if you are switching between things like an automatic DHCP config vs a manually assigned IP address, different routers with unique settings at different locations, toggling proxy use on or off, using different and specific DNS configurations, or just have custom network configs for specific places like work, home, or school. Making the Network Location feature even better is that you can instantly switch between preconfigured network customizations just by accessing an underused menu item. The network settings will change immediately with the selection of a new location, and using this menu bar trick is so much quicker than going through the preference panel. This trick has been around in Mac OS X for quite some time, but it often doesn’t get the attention it deserves. I use this constantly for changing network needs, and have configurations setup for auto and manual DHCP, proxies, alternate DNS settings that are faster on some networks, and a variety of other networks. While you’re setting this up, don’t forget that you can also change the connection priority for networks, meaning if some locations have multiple wi-fi networks and/or ethernet, you can set which connection type to prioritize.